My contact form doesn’t appear. Instead, a code [contact-form-7 404 "Not Found"] appears. Mail that comes through the contact form shows “WordPress” as its sender name. How can I change this? After submitting the form, I get an error message stating “There was an error trying to send your message.” What is wrong? I get an error message with an orange border even though I don’t use Akismet. My contact form always redirects to 404 error page after submission. Why does my email address input field look different than other text input fields? Can I add id and class attributes to a form element? REST API is deactivated on my site. Can I use Contact Form 7? After submission, my contact form redirects to a URL followed by an unfamiliar code like #wpcf7-f123-o1. Why? Is Contact Form 7 compliant with GDPR? Does Contact Form 7 track our personal data by stealth or transfer the data to external servers? I get spam messages through my contact forms. How can I stop them? Log into WordPress and open Contact > Contact Forms. Open the editor page for the contact form you want to add (Contact > Contact Forms). Each contact form has its own shortcode, such as [contact-form-7 id="1234" title="Contact form 1"]. Copy the shortcode and paste it into the content of the post. The code [contact-form-7 404 "Not Found"] is a sign that the contact form specified by the shortcode (described in the previous answer) couldn’t be found. Make sure you are using the correct shortcode. Insert a form-tag into the Form tab panel field. 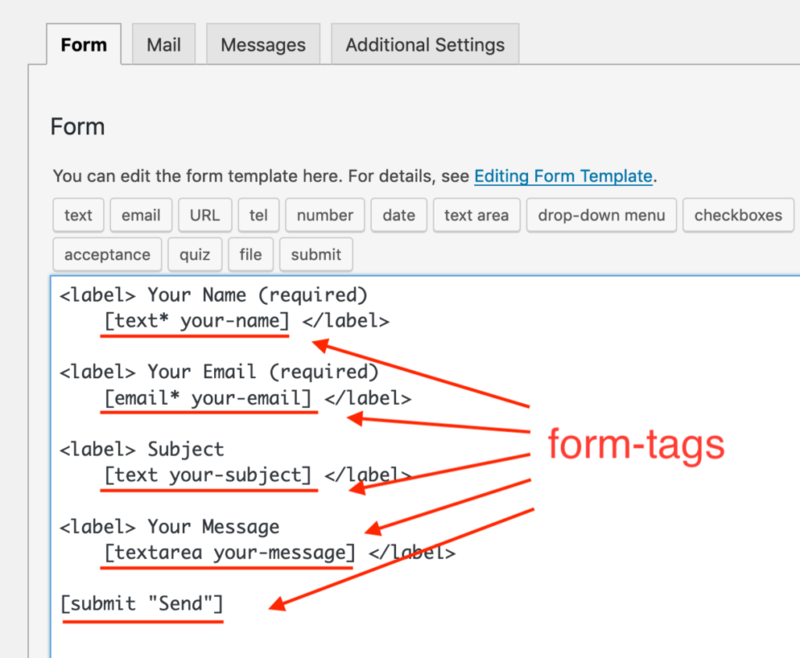 For more details about form-tags, see How Tags Work. You might feel that the form-tag syntax is a bit difficult to learn first time, but you don’t have to worry about that. The tag-generator buttons above the input area assist you. You need to add mail-tags to the fields in the Mail tab. These tags need to correspond to form-tags used in the Form tab. 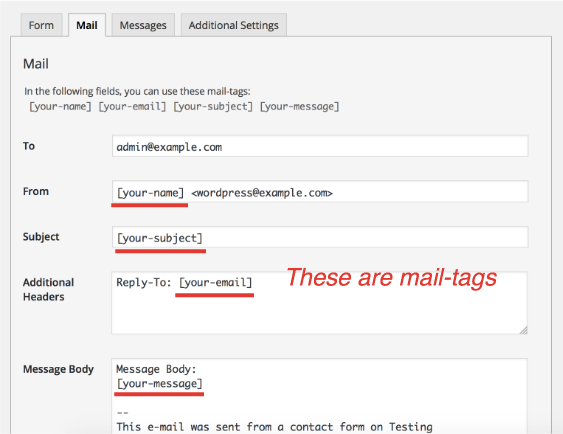 For example, when you used a form-tag [text your-new-field], the corresponding mail-tag that you should use in the Mail tab should be [your-new-field]. For more details, see How Tags Work. A mail-tag in the Mail tab will be replaced with the user input to the corresponding form field. Yes, of course. Simply check the “Use mail (2)” box in the Mail tab panel and set up Mail (2) as the template for autoresponder mail. Mail (2) is an additional mail template which works in the same way as the primary Mail template, but Mail (2) is sent only when Mail has been sent successfully. The second possible cause is that the form submission is under suspicion of spam. In this case, the error message would be surrounded with an ORANGE border line. The red border means that Contact Form 7 tried to send mail with wp_mail(), but it failed. To solve the issue, you need to find out the actual reason why it is failing in the first place. There could be various reasons such as the mail setup wasn’t valid. The sending would also fail if the mail server was down, inaccessible or experiencing other problems. In this case, it will be more difficult to solve the issue by yourself. I would suggest you contact your host for support. They may be able to check the error logs to find out the reason for the failure. In some cases, it is possible to solve this issue by using another mail server. The orange border is a sign of spam. Akismet, the spam filtering plugin, used to be the only reason for this orange border, but on the current versions, the error with the orange border occurs for multiple reasons. One of the reasons is the use of comment blacklist. Check your comment blacklist to see if you have words used in the problematic form submission. Also, Contact Form 7 3.1 has introduced nonce verification for contact forms. If the verification fails, Contact Form 7 treats the form submission as spam. This can occasionally cause false-positives when using cache plugins. When an old cache file remains for longer than 24 hours, nonce verification will fail, and you’ll see an error with an orange border. To solve this problem, make sure you have the appropriate garbage collection (clean-up) settings in the cache plugin. The cache should be emptied frequently (less than 24 hours). The configuration varies in different cache plugins. Consult your cache plugin’s support for details. This is most probably due to a conflict between plugins/theme. Try deactivating all other plugins and switching to the default theme. The W3C Markup Validation Service — HTML validation service. The W3C CSS Validation Service — CSS validation service. In HTML5, the email input field is represented as <input type="email" />. The text input field is represented as <input type="text" />. There is a difference in the ‘type’ attribute value. Yes. You can add any id and class to a form by adding the html_id and html_class attributes into a [contact-form-7] shortcode. You may want to reevaluate the deactivation of REST API. REST API is one of the most fundamental functions of current WordPress. All security issues reported in the past have been resolved. Consider reactivating it. This is because your contact form is working in non-AJAX submission mode. The following article explains possible reasons why a contact form doesn’t work in AJAX submission mode. Why isn’t My AJAX Contact Form Working Correctly? First, make sure that the DOM event is correctly fired. The event handler functions will be executed only when the event is fired. Contact Form 7’s DOM events, such as wpcf7mailsent or wpcf7submit, are fired in the process of an AJAX form submission. Therefore, when your contact form is working in non-AJAX submission mode, none of the events will be fired. I wish I could just answer, “yes”, but unfortunately it is not that simple. Ultimately, no WordPress plugin in itself can provide legal compliance, and the responsibility for making your contact forms compliant with legislation lies with the user (you). The only thing we can do is assist you with some advice. I’ve written a post that explains how you can make privacy-friendly contact forms, so please refer to it. No. Contact Form 7 never does such evil things. Remember that WordPress.org’s guidelines prohibit plugins on its directory from tracking users without their clear consent. You can protect your contact forms with the anti-spam features that Contact Form 7 provides. Contact Form 7 supports spam-filtering with Akismet. Intelligent reCAPTCHA blocks annoying spambots. Plus, by using the comment blacklist, you can block messages containing specific keywords or those sent from specified IP addresses.